Meru: Special Offers, Discounts, Coupon Codes and Deals on cab rides! This offer is valid for users of Meru Sedan, Meru SUV & Meru Hatchback. 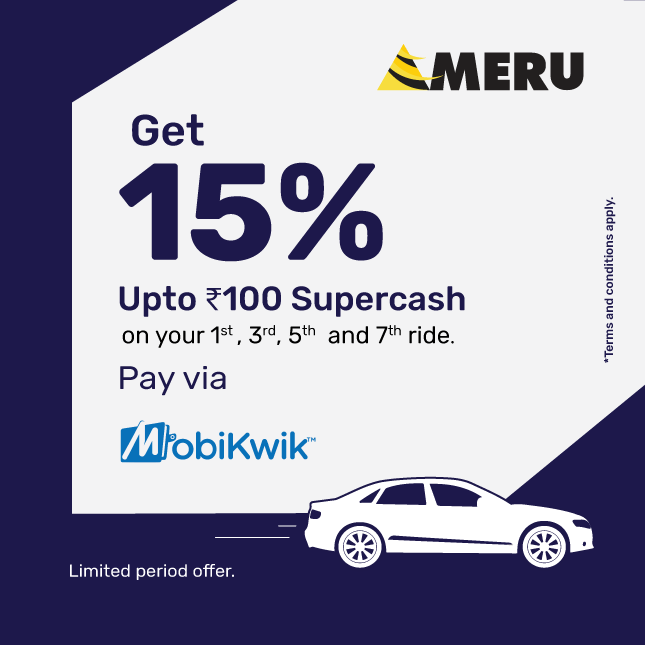 The user has to make the payment towards the applicable fare amount via MobiKwik wallet in Meru Cabs Mobile App or via MobiKwik QR code issued for Meru Cabs, placed inside Meru cab. This offer is valid once per user per month offer period in cities where Meru is operational. SuperCash will be auto-credited to user’s MobiKwik wallet within 24 hours by MobiKwik. The Company will not be responsible for any kind of cab-wallet payment failure due to technical malfunction of mobile network, mobile equipment, application system, software, failure for any booking to be received on account of technical problems or traffic congestion on internet/website /mobile application including any damages injury resulting from participation or downloading or uploading any details/material in the offer. State Tax / Toll / Parking charges / Airport fees etc which is payable extra. Failure of payment through cab-wallet. Two offers can't be clubbed. No cash alternative is available. No clubbing of offer shall be permitted. All disputes arising out of or in connection with this scheme are subject to the exclusive jurisdiction at Mumbai. Or, get the link on your mobile.